Neil, you are a wizard!! 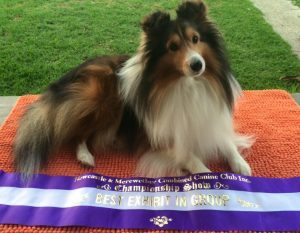 I was handling a 4 y/o Sheltie dog to his title, but he kept breaking gait, so I took him to Neil, my trusty doggy chiro. Neil diagnosed Riley with a long-term sacroiliac injury; he had significant pain in the hip joint, ligament damage & muscle wastage in the right hindquarter. It took a few weeks of treatment, then a few months for total recovery (ligament repair), but Riley became a new man, and finished his title in style with a Best in Group (photo of Riley with his sash). The acupuncture was the most amazing – a tiny needle in opposite paws and SHAZAAM, no more flinching!